Ideal to use as an activity to help children learn the letters in their name. Children cut and paste the letters from their name, record the number of letters then write their name with a pencil. 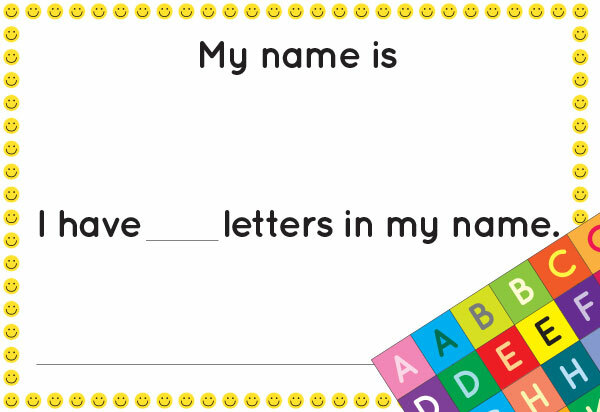 Print a copy of the Name Identification Worksheet with a set of alphabet letters for each child. Ask each child to find the letters of their name, cut them out, then glue them on the worksheet, so that their name is spelt correctly. Ask the children to use a pencil to write their name on the line at the bottom of the page. What comes next? – Repeat the activity using each child’s surname. If more letters are required, print off additional alphabet pages. If a child has a long name, reduce the print size of the letters so that they can fit the letters of their name across the page. If a child has trouble remembering the letters in their name, write their name on a post-it note. This resource is available in a black and white version.